Distance: 5K Start Time: ? I couldn’t turn this one down. It was free. For those of you who don’t know, I’m a computer operator for the Accounting Department at Coburg Dairy. Our story began when Robert walked up to my desk with a registration form and told me that Coburg Dairy was sponsoring a local 5K race at the baseball stadium, of all places, along with the Bubba Gump Shrimp Company. (They’re a local seafood place, and of course their theme is Forest Gump. I don’t think they’ve been sued yet.) He said that there were four free registrations available, and asked if I wanted one. It had been a while since my last event, and of course it’s much more attractive if the company is paying for it… so I said yes. Robert is the person who got me involved in these events in the first place. He runs four to five miles every morning. When I first started with Coburg, he clued me in about the Cooper River Bridge Run, and the rest is history. The strange thing is that I’ve never actually run with Robert. The Bridge Run is an enormous event, and we’ve just never bumped into each other. The Riverdog Run would be my first chance to actually run side-by-side with him, so I was really looking forward to it. 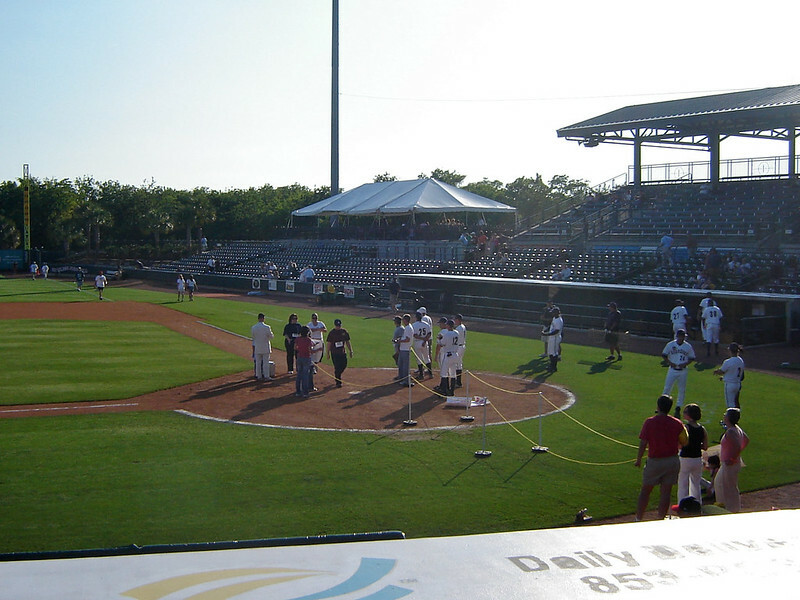 I was especially excited when I found out that we were going to finish over Home Plate! Unfortunately, I was a bit late that day, and then I got lost, and then I left the camera in the car. Yes, yes, I know. I was “batting 1000.” Very funny. 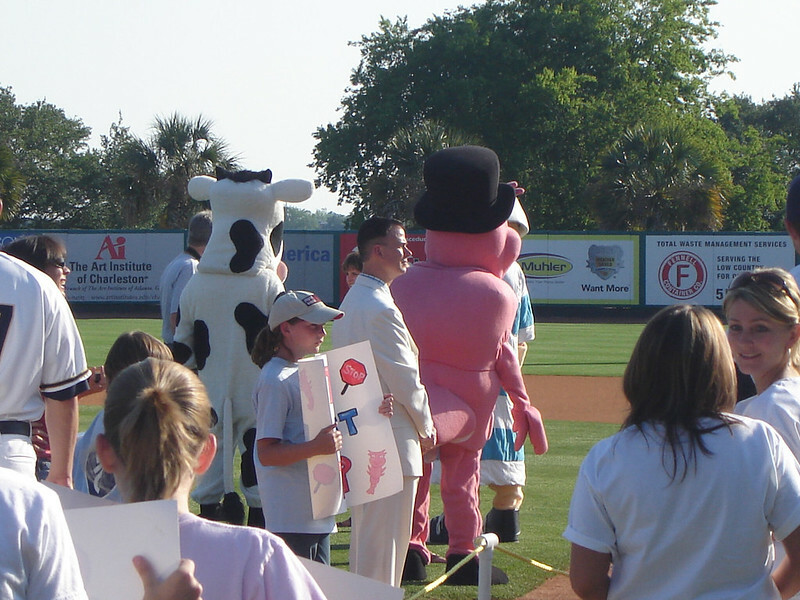 Anyway, I didn’t get any photographs from before the race, and it’s too bad because there were no less than for mascots in attendance. 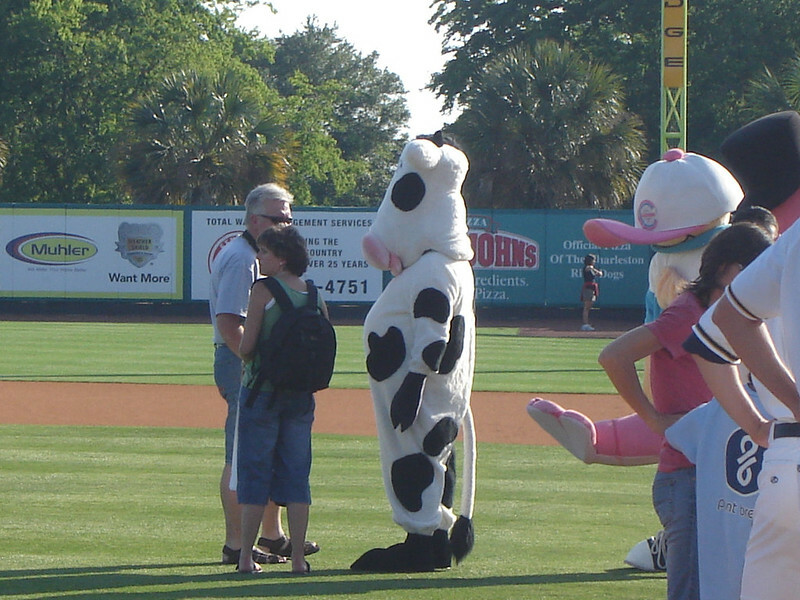 There was the Coburg Cow, Charlie Coburg, some guy in a big shrimp suit, and there was even a guy dressed up as Forest Gump. To my eternal shame, this is the best photo I could get of them after the event. I had to finish the race, run to the car, and then try to get a decent shot from a pretty good distance. I have to give some credit, here. The Forest Gump impersonator was really good. He never broke character, and he would gladly list all of the various kinds of shrimp dishes if you asked him. He really did his research, and it showed. Before the race, he even had a box of chocolates with him. There were only a couple hundred of us, so it was a small, cozy race. I ran with Robert, which was pretty cool. For some reason, though, he was going kind of slow. He had made some jokes that I would run past him, but I thought he was kidding. I looked over and saw that he was having a pretty difficult time, and it concerned me since he runs every day. This should have been easy for him. “Robert, are you alright?” I said. Now that’s dedication. Robert doesn’t break his morning routine for anything, so if the race isn’t in the morning, he can’t just wait. At least he wasn’t in trouble, though. He was just a bit tired since this was his fifth mile of the day. He kept telling me to go ahead, and eventually I agreed. After about a mile I picked up the speed and moved on. I couldn’t find anyone to pace with, so I spent my time gradually passing people. I was followed a little too closely by some old guy, and he almost passed me once. I’ll admit it, I got a little vain about it. I wasn’t about to be overtaken by some old guy. Every time I heard his labored breathing behind me I picked up my pace a bit. Very few people seemed to be in a hurry this time. I passed lots of people who were in better shape than I am, and you can see from the photograph below that fit people were finishing pretty late. I guess everyone was just out to have a good time, or maybe they wanted to stay for the baseball game and didn’t want to get too sweaty. 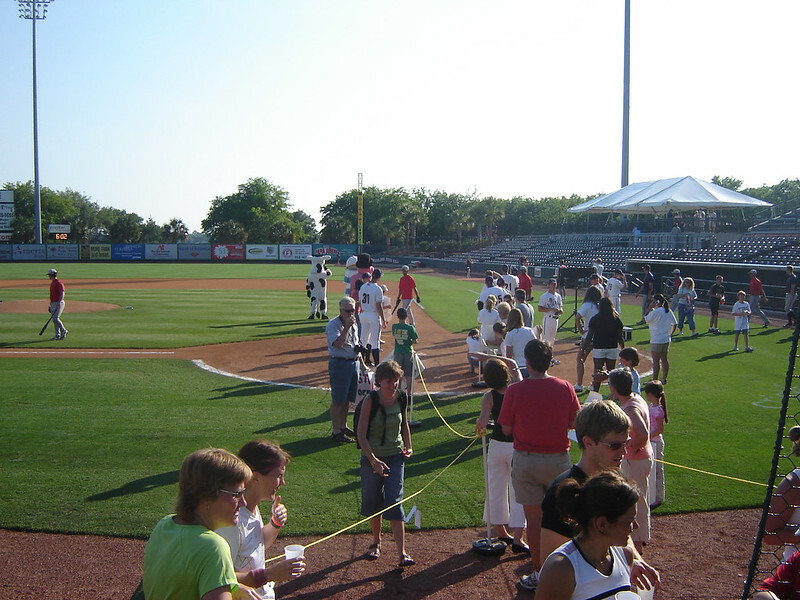 Runners finished by running down the First Base Line. For my part, I did okay. 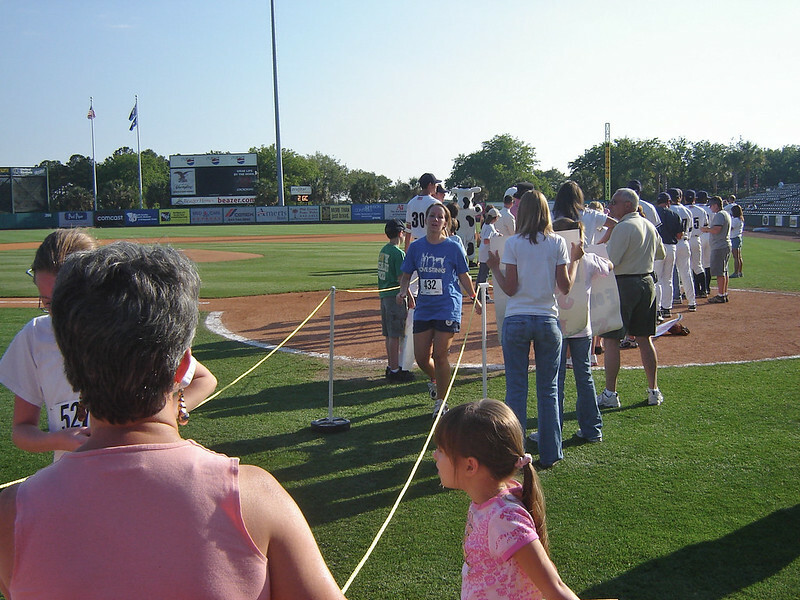 As I ran down the First Base Line to Home Plate, I tried to pass a woman in front of me. I almost did it, but she would have none of that. She sped up quite a bit, and people were laughing as we zoomed down the line. (Including the two of us.) In the end we were side-by-side and running out of space, so rather than tackle her I decided to slow down a bit. After we both “scored”, she gave me a high-five. That’s what I like about these events. We’re all happy, and we’re all winners. Forget my time, though. The clock had 24 minutes and change on it as I ran by, and that can’t possibly be accurate. A fast time for me would be just under 27 minutes, and I had stuck with Robert for the first mile. I don’t know when they started that clock, but it was obviously too late. All things considered, it was a fun event. I’m not crazy about the course, but I’ll probably try it again next year. I’m always hopeful that any young running event will grow, so I try to show my support when I can. Still, I miss the ocean. I miss running through downtown Charleston and the Battery. Something about the salty air on a sunny day agrees with me when I’m running.